Histoplasmosis: likely the most common disease associated with pigeons and bird contamination. Histoplasmosis is a fungal lung disease that is transmitted from pigeons to humans via dust and dander. The fungal spores would grow in a pile such as the one shown above, and then blow throughout the building. Yikes! Under damp and humid conditions, such as here in Florida, mold can grow easily. 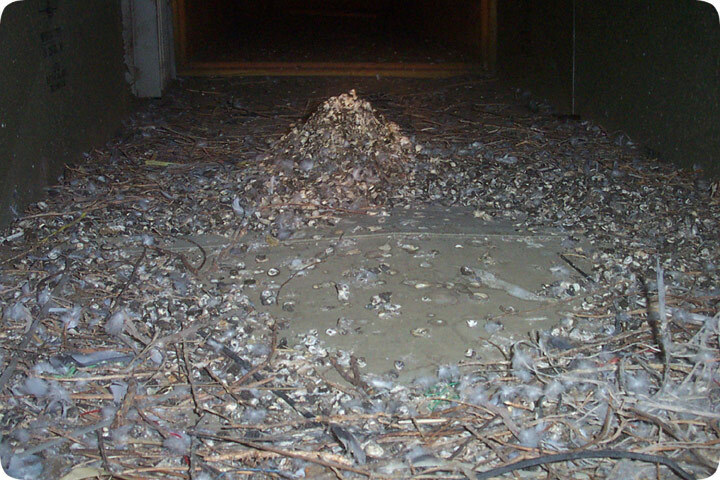 When the feather dander and dust are disturbed, such as when air flows through this duct, the spores can fly in the air, the mold can be inhaled and lodged in the lungs of the students or staff, where it can grow into a serious infection if not caught and treated. Cryptococcosis: is another fungal disease associated with pigeon droppings, though it is actually unlikely that healthy people will become infected. Most people who contract cryptococcosis have compromised immune systems, such as HIV carriers. Parasites: Includes the Pigeon Nest Bug and the bat bug (both related to the beg bug), soft ticks, biting lice and the pigeon flythese parasites. Though these parasites can bite and irritate, they are unlikely to transmit diseases to humans. The northern fowl mite and chicken mite are also possible in a pile of droppings like this. Although most parasites associated with bird droppings or nests die quickly after the birds leave, some may live for several weeks. Droppings, feathers, food and dead birds under a roosting area can breed flies, carpet beetles and other insects that may become a problem in the immediate area. Cleaning: This duct should have been cleaned and decontaminated. To clean the waste and the potential fungal spores, cleanup should be done by a professional, using both powerful disinfectants and enzyme-based organic waste cleaners. If I were to do this job, I'd wear a respirator that can filter particles as small as 0.3 microns and wear a disposable biohazard suit with gloves. During the cleanup, I'd have sealed heating and cooling air ducts and shut the system down. I'd vacuum out the main bulk of droppings, but first I'd moisten the droppings with a Disinfectant to keep spores from becoming airborne and keep them wet. All the poop and nesting material would be stored in sealed plastic garbage bags 3 mil thick, and when finished and while still wearing the respirator, I'd remove the biohazard suit and place it in the plastic bag. For parasite control, the roost area should be treated with a residual insecticide appropriately labeled by the U.S. Environmental Protection Agency for control of fleas, ticks, mites and similar pests.